It has been an interesting past two months since Michael Fassbender has been in the headlines with his work in 12 Years a Slave being recognized with many award nominations in the supporting actor category! As the award season comes to close next weekend, one thing that stands true is that Michael Fassbender has come a long way since I started supporting him about seven years ago, and it's awesome being one of his fans these days. On April 2, Michael will turn 37 years old. And to celebrate that, Fassinating Fassbender is conducting our 2nd fundraiser to support the Bike Experience charity. This is a UK based organization that modifies motorbikes to allow disabled persons the opportunity to ride once again, or for the first time on an enclosed racing circuit. Like all charities, The Bike Experience is grateful to our fundraiser, and is in desperate need for monies. Last year there were 48 donations made which allowed us to raise £1148, or approximately $1500! We surpassed our £1000 goal by 114% - this is the most money a Fassinator fanbase has ever raised for charity, and in our first year, this is incredible and heart warming! 1. The donor recognizes that The Bike Experience is a worthy charity and deserving of your hard earn money to be donated. Biking is Michael's favorite hobby sport, so the match up to this charity has a strong connection to Michael's lifestyle activities. 2. The donor wants to recognize her/his favorite actor's birthday. At the end of the fundraiser, a certificate will be sent to Michael's agent on April 1st informing them of the monies raised for charity in honor of Michael's birthday, and listing the names of all the donors in wishing Michael a happy birthday. 3. The donor is a regular reader/participant at Fassinating Fassbender (blog and pinterest) and is showing support as part of a unique group of Michael's fans. The Just Giving page for the 2014 fundraiser is being created right now, and on Thursday, Feb. 27th, the link will be posted up here on the blog to start collecting donations from Feb 27 through Monday, March 31st. Multiple donations can be made, and they can be made anonymously, the donation amount can be hidden as well. Like last year, some people had difficulty using their credit/debit cards on the site. Just Giving is a UK based organization and sometimes people need to inform their credit card that they are making a purchase/donation on a British website. I can help people make their donations by having them email me so that I can arrange the donation to be made to me via Paypal, and I will turn that money around and post it at Just Giving, with the donor's name. I think I did these for about 4-5 people last year. If you have any questions, please let me know. I want this fundraiser to be another success. 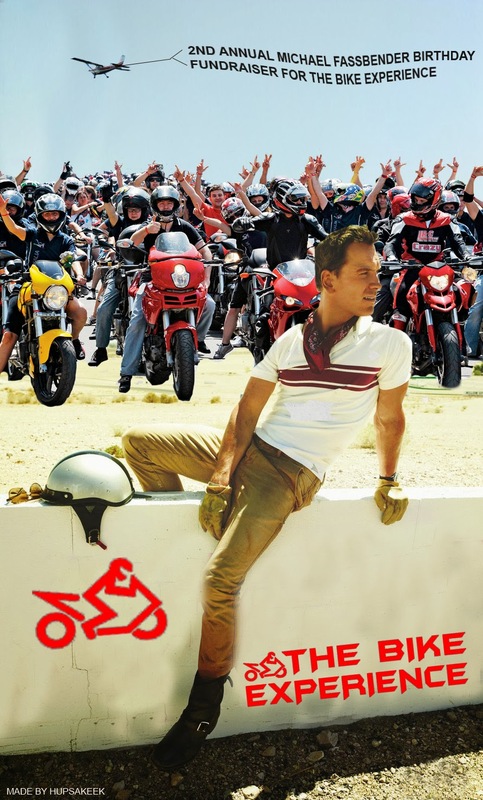 All monies, of course, automatically and directly goes to the Bike Experience, Fassinating Fassbender's connection is the fundraiser for the cause of honoring our favorite actor's birthday. We would be extremely grateful to FF if you were to consider continuing your kind support for the charity. From the past two years of accounting, we need to raise £20,000 in order to continue to provide the services to the riders for free. I don't want to have to charge the riders anything as a lot of disabled people have limited funds and often have to live off the state benefit (like myself). The major percentage of the costs is the hiring of the venue which we use to teach on (Silverstone Old Copse Runway area), as well as servicing and upkeep of the motorcycles. We are attending various events this year to try and raise funds/awareness, as well as offering 13 teaching days to disabled riders. We will be attending Prescott Bike Festival, Bikes on the Farm, Bulldog Bash, and we are applying to the NEC to have an official stand at the Motorcycle Show. It should be another fantastic year ahead (providing we can fund the charity). I trust all is well with you, and thank you once again for thinking of us. This post was originally shared in the Fassy News Network newsletter on Saturday. We will begin collecting donations later this week and throughout the duration of March. More information regarding a raffle will be announced on Thursday. Looking forward to being part of this wonderful initiative!!! Oh yay. I'm very happy and excited to show support again this year.